In 1939, while working on the wildly popular fantasy epic The Thief of Bagdad, émigré producer Alexander Korda, along with Michael Powell (one-half of the estimable directing team of Powell and Pressburger), Brian Desmond Hurst and Adrian Brunel, directed a propaganda film called The Lion Has Wings. The film contained an unlikely mix of G.P.O. Film Unit documentary footage, maudlin storytelling, and anti-German sentiment. The story revolved around an R.A.F. Bomber Command pilot (played by Ralph Richardson), who is called into service and undertakes a (supposedly) dangerous mission against German shipping on the Kiel canal. The film even ends with a squadron of Spitfires thwarting a Luftwaffe raid, an eerie premonition of the Battle of Britain, which was still months away. 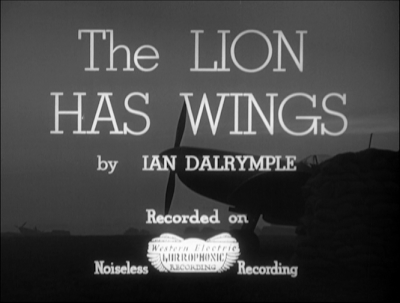 The Lion Has Wings serves to promote the R.A.F. 's prowess and to reassure the public about England's military preparedness. Yet the film is remarkable as it was created in an incredible climate of collaboration between architects and filmmakers. This is not surprising as it was Korda, after all, who produced the screen adaptation of H.G. Wells's Things to Come in 1936 (which like, The Thief of Bagdad, was directed by William Cameron Menzies) and who hired László Moholy-Nagy to create the special effects for the film. Korda and Wells were also friends with other Bauhaus alumni, most notably Marcel Breuer and Walter Gropius, who were residing in London at the time, both leaving for the United States shortly thereafter. 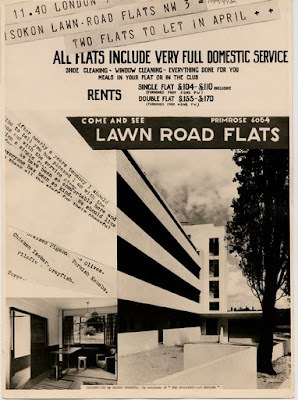 Their haunt was Welles Coates' Lawn Road Flats, a constructivist fantasy of a building that would be the temporary offices for Breuer, Gropius, Moholy-Nagy, as well as for M.A.R.S. members Maxwell Fry and Morton Shand. Propaganda in The Lion Has Wings has an architectural bent. 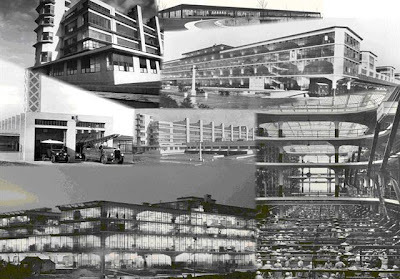 In fact, one could very well say that it is an instance where architectural modernism is mobilized for war. This is evident in the opening moments of the film. Following images of bucolic English countrysides and busy cities, narrator E.V.H. Emmett describes England's achievement in creating clean, well-lighted, sanitary, and (sometimes) leisurely environments. 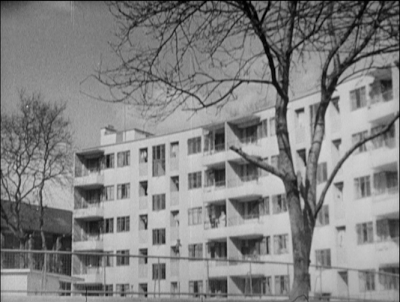 During this narrative (which sounds like a laundry-list of Athens Charter principles), audiences would then see current examples of English architecture. Touted as pinnacles of English rationalism, these images serve to show that it is Britain, and not Germany, who is the world leader in creating hygienic spaces. Two buildings share the limelight in the opening moments of The Lion Has Wings. The first is Maxwell Fry's and Elizabeth Denby's Kensal House. Built in 1937, Kensal House was one of the first attempts for re-housing urban slum dwellers under the strictures of the 1930 Greenwood Act. The Lion Has Wings features different views of the project. In an aerial shot, the buildings signature curved facade is clearly visible. In another, the clean, flat white walls shine brilliantly in sunlight. The other is Canadian Owen Williams's Boots D10 "Wets" Factory, a building known by its large reinforced concrete spans and commodious lighting. The building is shown in The Lion Has Wings as an example of new factories that would increase worker productivity while keeping clean and healthy environments. [I]s an open type of planning (the whole of the building being open to air and sunlight) as opposed to the old-fashioned idea of fitting as much accommodation on the site as possible by creating courts and unventilated areas ... by means of the general lay-out, as well as by the profusion of glass areas, a very light and airy effect is obtained, in opposition to the usual rather grim and sordid character of buildings of the same description. 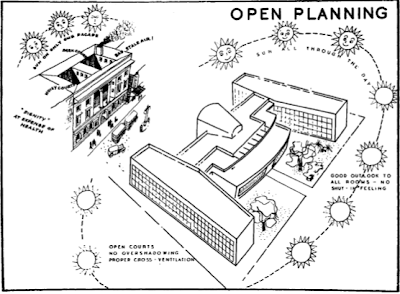 The cartoon shows Lubetkin's clinic, clean, spacious, symmetrical, alongside a cramped, dank non-modernist hospital. Whereas statements like "Dignity at the Expense of Health" and "Bad Stale Air!" grace the latter building, for the Finsbury Heath Centre, Cullen uses claims like "Open Courts, No Overshadowing, Proper Cross-Ventilation" and "Good Outlook to All Rooms -- No Shut-In Feeling" to give the reader a sense of just how advanced the building was. [S]howed the façade of the Finsbury Health Centre in vibrant colour. Behind that façade, however, lurked the devastation of an inner urban slum corner (labeled 'disease' and 'neglect') in which a boy suffering from rickets played with a toy boat. 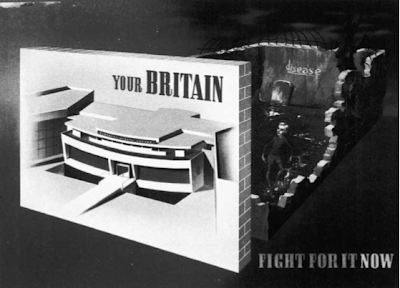 It promised a modern Britain rebuilt on hygenic foundations but was, ironically, banned by Prime Minister Churchill as being a disgraceful libel on pre-war conditions in British cities. Although not libelous in the same sense as Games's poster, the depiction of architectural modernism in The Lion Has Wings serves another purpose: to condemn the urban conditions in Germany. With images culled from Leni Riefensthal's Triumph des Willens (1935), it is not too tenuous to suggest that Korda, et al. are claiming that it was the unhygienic, crowded conditions of German urban centers that allowed Hitler to come to power. On the other hand, one must pay attention to the pedigree of architecture in The Lion Has Wings. 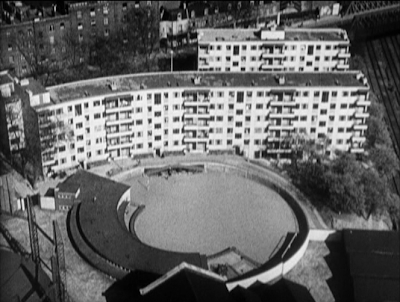 To emphasize the primacy of architectural modernism in England, the directors opt to show buildings by English-speaking architects. There are no Berthold Lubetkins, no Serge Chermayeffs, no Erich Mendelsohns in The Lion Has Wings. 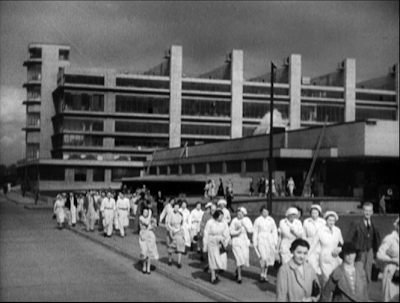 Pyrs Gruffudd, "'Science and the Stuff of Life': Modernist Health Centres in 1930s London", Journal of Historical Geography, 27, 3 (2001), p. 408. Great piece Enrique. The old hospital lampooned in Gordon Cullen's cartoon looks very much like UCL Hospital off Goodge Street/Tottenham Court Road, where my son was born last year - which is still exactly the same as it was at the time of Cullen's sketching I'd guess, albeit immersed in waves of later development. So the 'progress' depicted in the film moves in fits and starts, but doesn't actually replace. So Games's cartoon is hopeful, indicating Lubetkin's health centre apparently replacing that which was there before - when in fact the past persists in the same future. So UCL Hospital is a complex melange of contemporary, modern, Edwardian and Victorian simultaneously.